That is what I heard a mother say to her daughter when I was walking in one of this country’s most urban and diverse places in the country – Brooklyn, NY. The mother’s request was a great reminder to remember the universal appeal of nature and children’s innate love for the outdoors. No matter the location, we all want to see fireflies. I had this “ah ha” moment as I was walking to the first ever Great American Backyard Campout in Prospect Park, Brooklyn on Saturday, June 25th. That’s right – nine families along with mine camped out right in the middle of Brooklyn. Oh what a night! National Wildlife Federation, the New York City Department of Parks and Recreation, and REI teamed up to offer this unique experience under the stars in the heart of Brooklyn. Our goal was to have some fun and get families outdoors to experience nature wherever they live. NWF has a comprehensive program to reach children and families, including our “Be Out There” campaign and other education initiatives. NWF’s amazing Director of Education, Eliza Russell, led a flag-making craft with all the kids making flags to identify their tent. 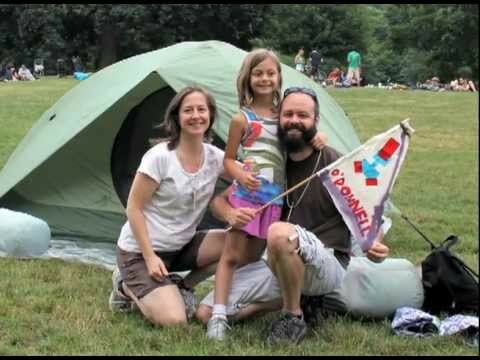 Check out the photos with the families making their flags and showing off their handy work. This enthusiasm was matched for NWF Ranger Rick’s Geocache Trails. REI brought a bunch of GPS units and the kids and adults found our top notch geocaches with gifts and fun for all. Thanks, REI, for your financial support of this great event and the REI staffers were terrific. Capping the festivities was a nighttime hike into a natural area of the park known as the “ravine.” The kids were all decked out with flashlights and a youthful dose of adrenaline to see what was out there. The slugs were the big find of the night — “nature’s mobile recycling unit,” according to Park Ranger, John. In other words, slugs digest leaves and other organic matter — sort of like a mobile compost unit — that frees up nutrients for the forest to grow. The kids became expert slug spotters, and even found a baby one too. The Best Marshmallows: Roasted or Banana Boat? For most of the kids and adults, toasting marshmallows were a highlight of the evening. Eliza Russell introduced many of us to the banana boat. I am traditionalist – a toasted marshmallow browned all over never burnt (I am still trying to teach my kids how to be patient enough to allow the ambers to get just right for proper toasting – hasn’t worked yet). Take one banana, peel back one quarter of the peel, and scoop out about a third of the fruit. Here is the good part – fill with small marshmallows and chocolate chips. Pull back peel. Wrap whole banana in aluminum foil. Place on the side of the fire for five minutes. Find utter goodness and the end of your search for happiness when opened. My favorite part of the event was returning to the “ravine” the next day with Seth, my son. We wanted to see the waterfall that we spotted the night before. Seth decided to shoot a video, and I loved that, during the shooting, he noted that we need places “like Prospect Park” for wildlife. I want to offer a special thanks to all the super NYC Urban Park Rangers who made this event possible and REI for their staff time and financial support. The NWF team was equally fabulous. Karoline Hurd organized the event from start to finish. She had some timely help from Emily Maxwell and Meri-Margaret Deoudes. Even if you couldn’t camp out on June 25, you can still register at backyardcampout.org and camp out whenever you feel like it! Once registered, you’ll get access to great recipes, games, and tips.